We were delighted as these results reflect all the hard work of students, as well as all the work undertaken by staff in preparing students for their new examinations. English and Mathematics both scored a very impressive 87% at 4+ (equivalent to the old C grade). The new "tougher" measure of 5+ grades in both English and Mathematics is a challenge for all schools nationally. We were very pleased to see that 59% of our students gained this outcome in both subject areas, again well above national average figures and an improvement on last year. Results in other subjects were also very strong as can be seen in the graphs below. Should the old 5+ including EM figure still exist, then we would have achieved 78% of students with C+ across 5 subject areas including English and Mathematics. Students of all abilities have exceeded many of the accomplishments of last year. At the highest level, 28 students gained 8 or more 7+ or A* and A grades with 70 students gaining 5+ A*A or 7+ grades. Over 287 students gained eight or more GCSEs and over 690 A* and A grades were achieved. 66% of those taking the EBacc combination of subjects gained 5+ in all areas equivalent to 23% of the cohort and 86% of those taking the EBacc combination of subjects also gained 5+ in English and Mathematics. In individual subjects there were some excellent results with the Mathematics and English results continuing to be outstanding and results in Biology, Chemistry, Physics, Languages, Art, History, IT, Textiles, PE, Philosophy, Media, Hair and Beauty far exceeding national figures. Congratulations to all our Year 11 students; these results are a great achievement! 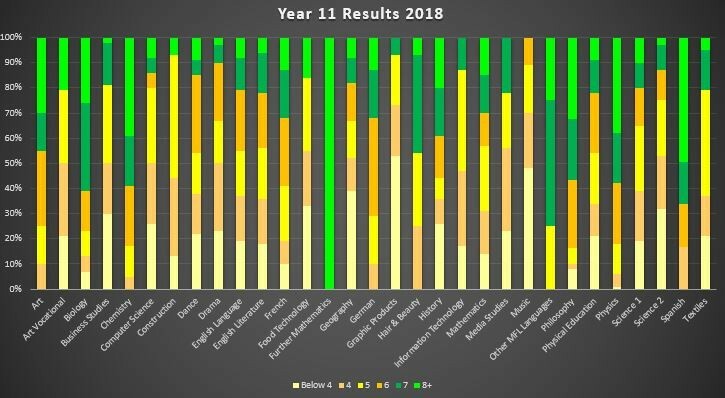 WARNING re National Performance Tables for 2016 and 2015: These show Year 10 results, when students were half way through their courses, not the final results. More information about why there is this difference can be found here.